Aerial view of the debris after a dam burst at the small town of Bento Rodrigues in Minas Gerais state, Brazil, Nov. 6, 2015. 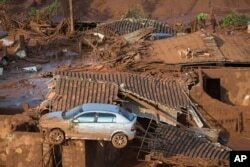 Rescue teams searched through mud and debris on Friday for people still missing from a village devastated by the collapse of two dams at a Brazilian mine owned by the world's largest mining company, BHP Billiton. While only one worker has been confirmed dead, the local governor said the mining disaster caused the most environmental damage of any in the state's history. It could cost the mine's owners a fortune to clean up and repair. "I heard screaming and saw the water coming fast, about 15 to 20 meters high [49-66 feet]," said survivor Antonio Santos, a construction worker who was at home when the dams broke. Bento Rodrigues is about 93 miles (150 km) southeast of Belo Horizonte, Brazil's third-largest city and the capital of the mining state of Minas Gerais. "Within 10 minutes the whole lower part of the village was destroyed, about 80 percent of it," he said in a gymnasium crowded with survivors in the nearby city of Mariana. Mine operator Samarco's chief executive officer said a tremor in the vicinity of the mine may have caused the dams to burst, but that it was too early to establish the exact cause. The company said one worker died and 13 were missing. Samarco is a 50-50 venture between BHP Billiton and Brazil's Vale, the world's largest iron ore miner. The company said it had set no date to restart the mine, which produces about 30 million tons of iron ore annually. Output is shipped to Brazil's coast and converted into pellets for export to steel mills. A car and two dogs are seen on the roof of destroyed houses at the small town of Bento Rodrigues after a dam burst on Thursday in Minas Gerais state, Brazil, Nov. 6, 2015. "It impossible to calculate now, but it is not going to be cheap," said Danilo Miranda, of the Marcelo Tostes law firm. A Minas Gerais state prosecutor in charge of environmental crimes, Carlos Ferreira Pinto, said he would seek a temporary suspension of Samarco's license on Monday. The University of Sao Paulo's seismic center reported four weak tremors in the general area of the mine in the hour before the disaster. But Vescovi said there had been no sign of any breach in the dams immediately after the tremors occurred. Analysts at Clarksons Platou Securities said the likelihood of a lengthy stoppage at the Samarco mine, which accounts for about one-fifth of seaborne pellet market, could lift iron ore prices. Prices were not immediately affected, however, and continued to fall on Friday. It was the second major tailings dam disaster in Minas Gerais in 12 years. In 2003, 1.2 billion liters of waste from a tailings dam at a closed cellulose mill broke, flooding local rivers, cutting off fresh water to more than 600,000 people, and killing fish all the way to the Atlantic Ocean.